A raucous western, When The Dalton Rode is historically suspect but packs action, stunts, extras, comedy and romance into a thrilling package. On his way to Guthrie, lawyer Tod Jackson (Randolph Scott) stops in Coffeyville, Kansas and inquires about his childhood friends the Daltons. 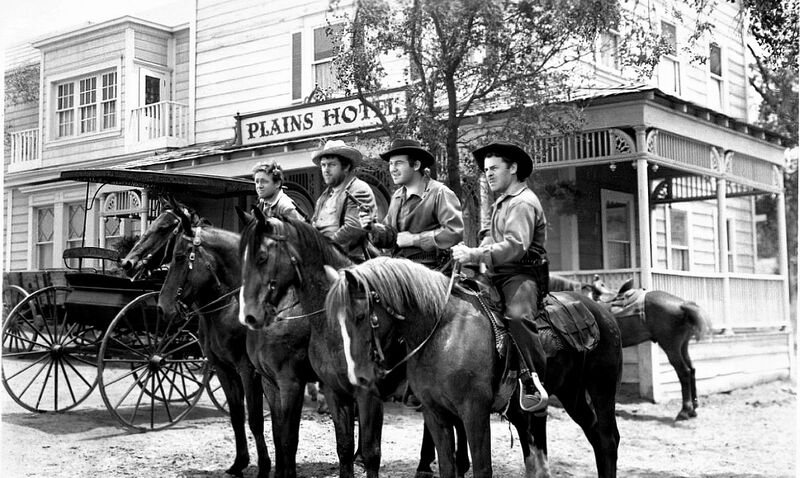 Soon he stumbles upon Bob Dalton (Broderick Crawford) who is the local Marshal, and his brothers Grat (Brian Donlevy), Ben (Stuart Erwin), and Emmett (Frank Albertson) and their Ma (Mary Gordon). 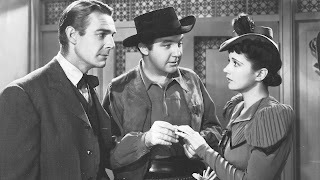 Tod also meets and quickly falls in love with local girl Julie (Kay Francis), before finding out that she is Bob's girlfriend. Along with family friend Ozark Jones (Andy Devine), the Daltons are pushed into taking the law into their own hand when the evil Kansas Land and Development Company threatens their property and Ben is accused of murdering a surveyor. With Bob as the gang leader the Daltons take to the hills and become notorious outlaws, robbing a succession of banks and trains in several states. Meanwhile Julie is left behind, very much in love with Tod but unable to give up on Bob. Only loosely inspired by actual events, When The Dalton Rode joins the stream of movies from the era taking a sympathetic look at famous western outlaws. After a slow opening half an hour, director George Marshall kicks the action into gear and the remainder of the brisk 82 minutes of running time is genuinely impressive. Once the Daltons turn into a gang, the action is unrelenting, and the set pieces are very well staged. When The Daltons Rode is particularly notable for the frequency and quality of stunts, including a perfect Yakima Canutt under-the-stagecoach special, several leaps from horses onto trains, with an exclamation mark featuring a succession of horses and riders galloping off a moving train. Not satisfied by the breathless thrills, Marshall throws in plenty of humour, almost all of it courtesy of Andy Devine's Ozark character, who is incongruously a magnet for the ladies. The comedy always threaten to border on the ridiculous, but Marshall and Devine conspire to consistently land the jokes on the right side of funny and sometimes hilarious, a memorable pie-on-a-wagon moment taking home the cake. Marshall also deploys throngs of extras in several teaming crowd scenes of prodigious power. An unruly courthouse melee and a mob near-lynching are executed with unusual raw intensity, cinematographer Hal Mohr allowing his cameras to get up close and personal with the carnage of angry men - and some women - pushing and shoving with intent. All the focus on the wild antics of the Daltons does mean that the two notable stars take a back seat for most of the film. Tod Jackson and Julie are more framing devices than central characters, and here are used to ensure that empathy can be parked with two people who stand for good. The romantic chemistry evaporates early with a telling moment at the end of the film where an old codger mistakes Tod and Julie for brother and sister. Randolph Scott and Kay Francis grin and bear it, Scott never even wearing a gun and allowing himself to be frequently victimized. Broderick Crawford gradually takes over the film in an impressively aggressive performance as Bob Dalton. 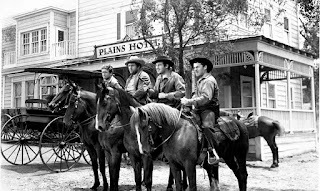 When The Daltons Rode may be a sympathetic and fictional portrayal of murderous outlaw thugs, but it is nonetheless a rollicking good time.